If you have not changed your own vehicle’s tire before, it can seem like quite a big job to do. 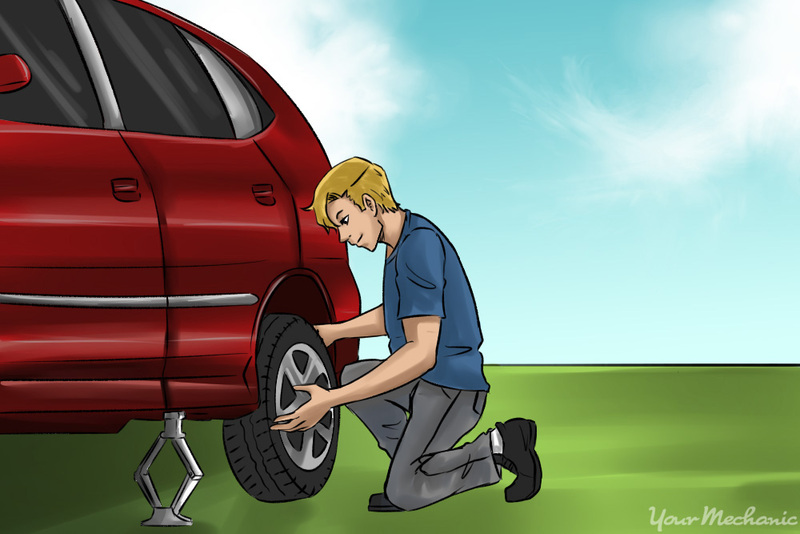 However, with some knowledge and the right tools, you can change your vehicle’s tire in as little as 15 to 30 minutes. Follow these steps so that when that flat unexpectedly does show up, you can change yours with confidence too! Step 1: Locate a flat surface. Ensure your car is parked on a flat surface, away from moving traffic. Step 2: Park your vehicle. Make sure your car is in the Park gear position if an automatic, and in the First or Reverse gear if you are driving a manual car. 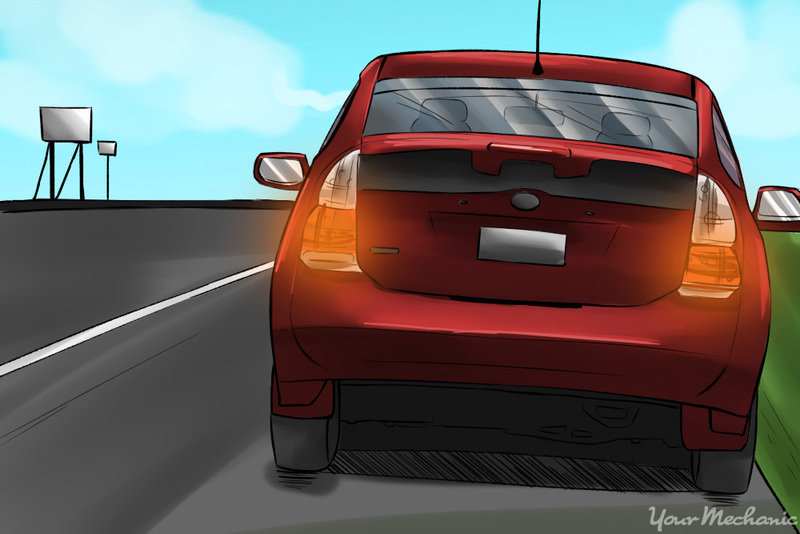 Step 3: Turn on the hazard lights. 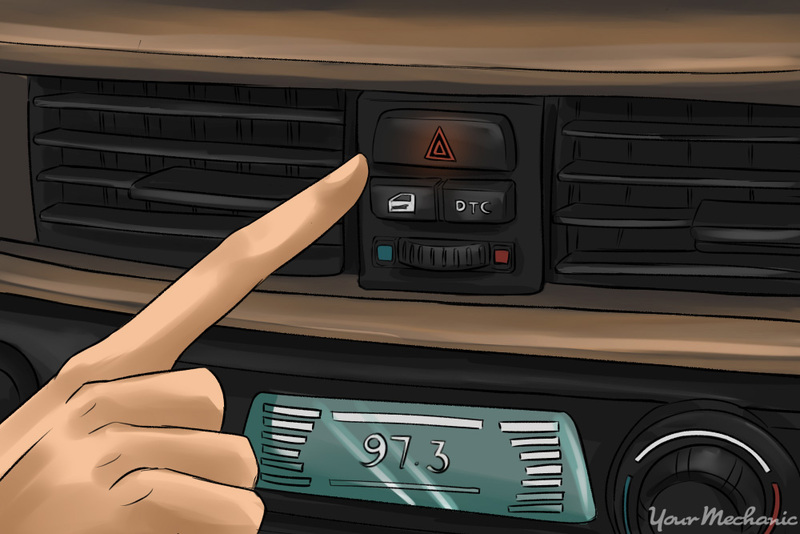 Turn on your car’s hazard lights, located on the dashboard. This is important even if you are changing your tire at home. This is due to the fact that some vehicles are equipped with a feature known as Air Ride Suspension. ARS will disable the automatic leveling in the car only when the hazard lights are on, in turn allowing you to safely lift the vehicle. Step 4: Immobilize the car. Whatever tire you are changing, locate the tire diagonal to it. 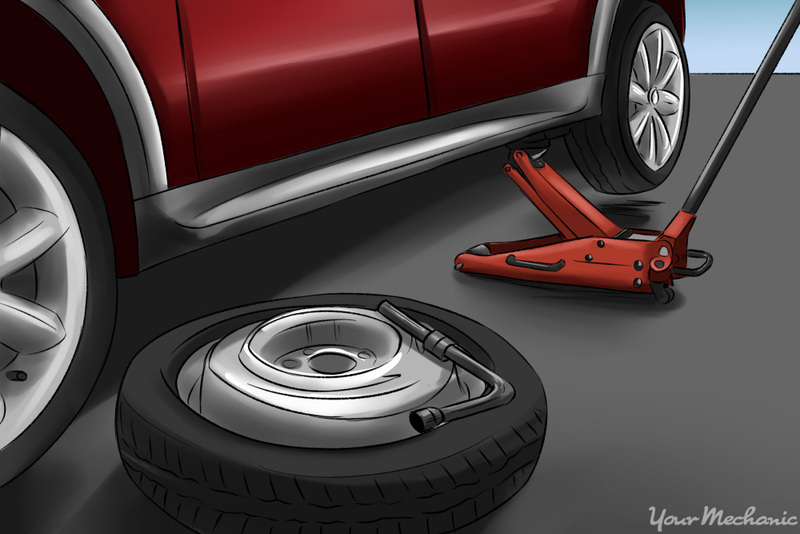 For example, if you are needing to change your front driver side tire, locate the back passenger tire. This tire needs to be blocked with a heavy object behind it, to avoid the car from moving during the tire change. If you do not have a wheel chuck, you can use a large rock or a two-by-four piece of wood to do this. A scissor or hydraulic jack, usually included with the vehicle. The spare tire – this is either a full-sized tire or a donut. A tire iron/wrench, which is usually included with the vehicle. This item will play a triple purpose: first as the pry bar to remove hubcaps, second as a way to remove the lug nuts from the wheel and third, as handle for the jack. The exact size socket for your lug nuts. A breaker bar. This is a long wrench used to break loose tight lug nuts. A jack stand to help support the car if the jack gives out during the tire change. 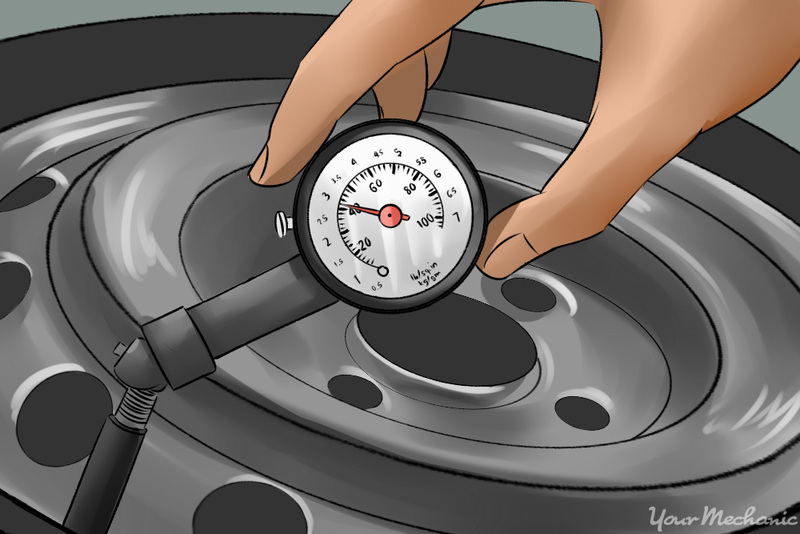 A tire pressure gauge to measure the air level in the tire before the change, and to also check air in the other three tires and the spare tire. 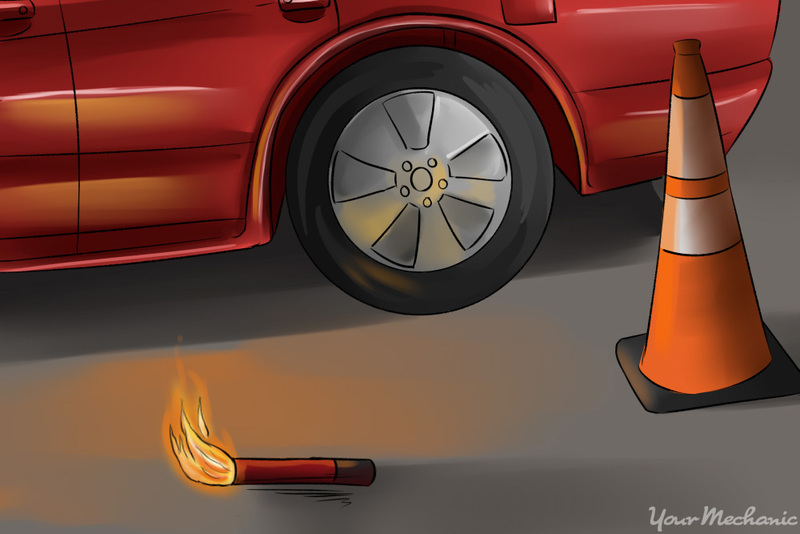 Road flares and a small orange traffic cone will help warn others that you are on the side of the road changing your tire. A pair of gloves will help keep your hands clean and can also help you with avoiding bringing back dirt and debris into your car. Most spare tires are located in the vehicle’s trunk under the carpeting; however, in some pickup trucks and minivans, the spare tire can also be located under the vehicle. Note: More and more modern cars have tires that are called Run Flat Tires. Instead of having tires that are replaced with a spare tire, the car is instead designed with a tire pressure sensor to monitor the exact pressure in each tire. When this alert comes on your dashboard, it means one or more of your tires is low. The Run Flat Tires generally allow you to drive up to 50 miles with no air in them, which will then allow you to safely get to the nearest tire facility for repair or replacement. 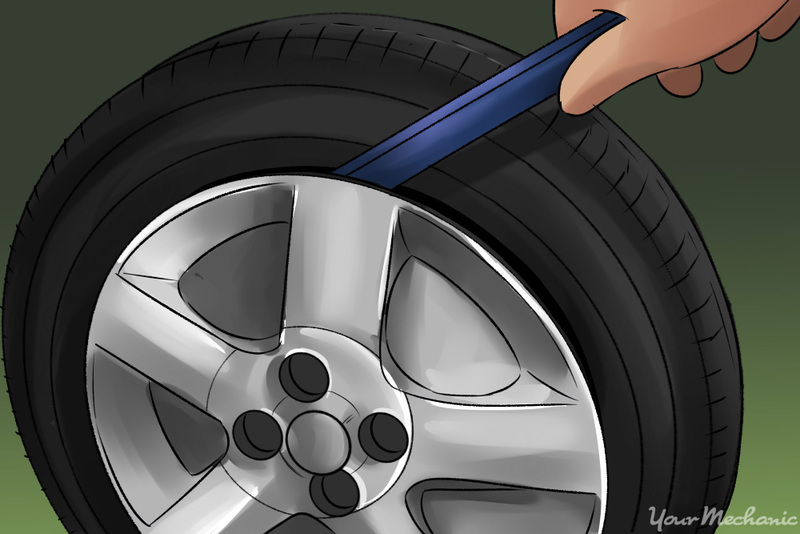 These are the steps you need to take when changing your vehicle’s tire. Step 1: Position the jack. 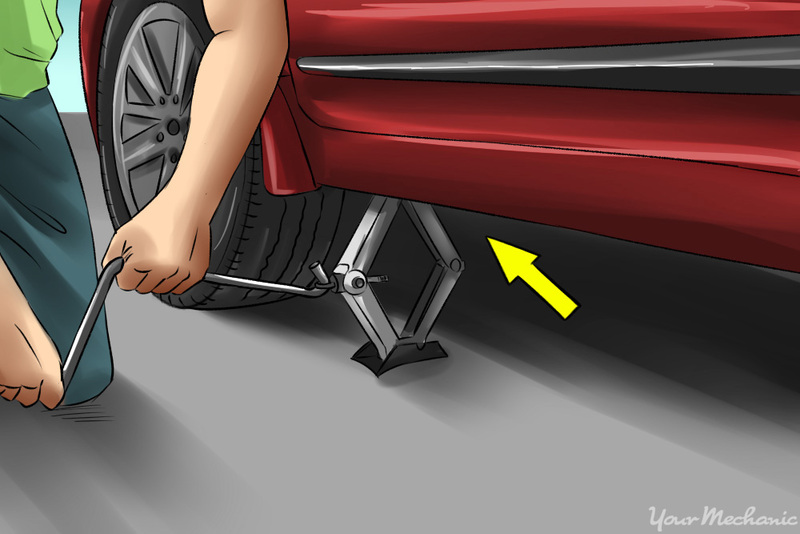 Position the jack flat under the car to relieve some pressure off of the lug nuts. This is so they will be easier to remove or to break loose. Most cars will have marks or arrows showing where to place the jack. Others have rubber pads for jack placement. It is important to verify this in the owner’s manual because placing your jack in the wrong spot can lead to serious damage. Step 2: Remove the hubcap. Now remove the hubcap with the pry bar end of the tire iron/wrench and use that tool to loosen, but not remove, the lug nuts from the wheel. Be aware that some wheels have lug nut locks and you will have to be sure to have the required key to remove them. Step 3: Lift the car. Make sure the jack is not angled but is positioned flat on the ground. 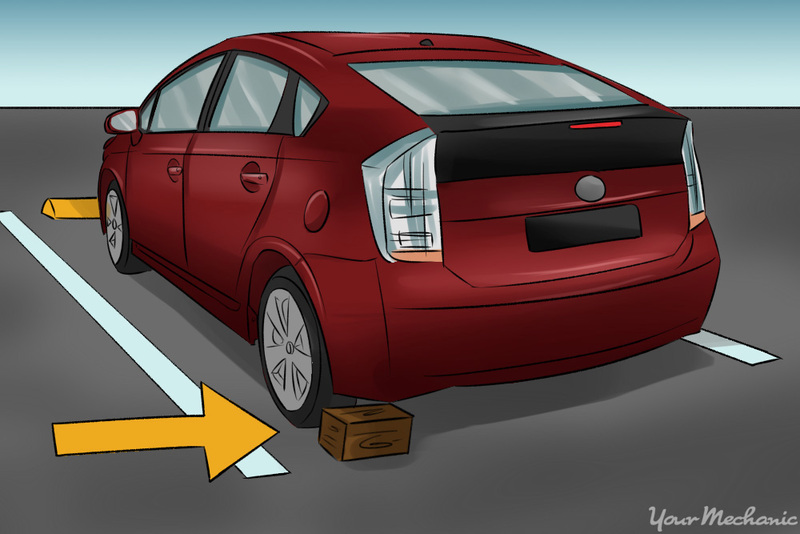 Once this is verified, begin to lift the car so the tire you are changing is completely off the ground. The jack should be lifting straight up and, as you crank, the vehicle should remain stable. If at any time the car does not feel stable, lower to the ground and re-position the jack. It is now that you can use any supporting jack stands to help keep the vehicle stable in the case of jack failure. Step 4: Remove the lug nuts. 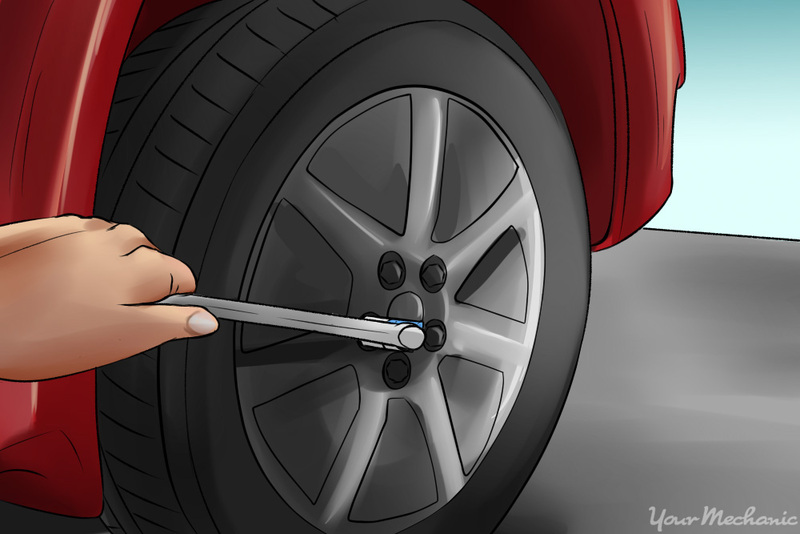 Use your tire iron/wrench to remove the lug nuts completely and set aside. With both hands, pull the wheel straight off from the hub. Occasionally the wheel can feel stuck due to situations like rust build up, so you can attempt to give it a swift kick with your foot to help loosen the tire from the hub. Step 5: Install the spare. Pick up your spare tire and install it straight onto the hub, just as you removed the old tire. Take your lug nuts and place each one back on their spoke. Begin to hand tighten each lug nut in a clockwise position until tight. Step 6: Lower the car slightly. Return to the jack and lower the vehicle slightly so the tire is resting back on the ground, just enough to give it enough resistance. 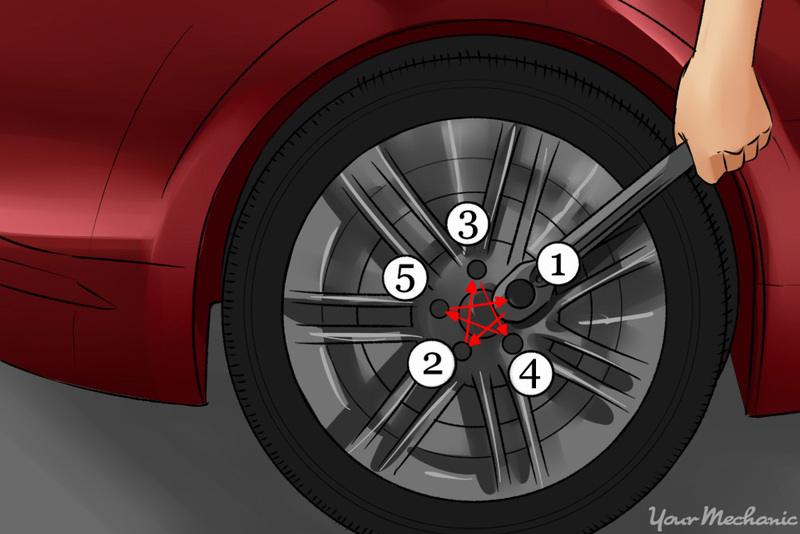 Here you can use the tire iron/wrench, or your breaker bar if you have one, to tighten the lug nuts even more. Do so in a crisscross pattern to ensure that the wheel is installed square and evenly onto the hub. Step 7: Return the car to the ground. You may now use the jack to lower the vehicle all the way down to the ground. Remove the jack from under the car and once again double check your lug nuts for tightness. Step 8: Check the tire pressure. If you have it, use your tire pressure gauge to check the air pressure in your spare tire and then in all other tires. Spare tires should be similar to your other tires, measuring in at least 42 PSI. However, if your spare is a donut, it will need to read in at 55-60 PSI. You can verify this number with either your car manual or with the sticker located in the door jamb area of your vehicle for what your tires should read. Step 9: Clean up. Take your flat tire and place it, along with your tools and any emergency notifications in the trunk of your vehicle. Be sure to remove the wheel chuck or any other item placed behind the opposite tire. If your spare tire is a full-sized tire, you can drive your car like normal once it is installed. However, if you have a donut spare, it is meant to be a temporary fix and it is not designed to drive over 55 mph. Step 10: Locate a replacement full size tire. You have successfully changed your tire! Your last step is to locate your nearest tire shop. At the tire shop you can request to have the lug nuts even more fully secured with a torque wrench. This is also where you can inquire about tire repair and purchase if necessary. It is a must to learn tire repair in order to be prepared when you experience tire problems along the road. Doing so will minimize further problems in your tire. It is also needed to keep a tire repair kit in your car.